Have you made up your mind to create a website on your own? With so many website builders available in the modern design niche, the choice of the best solution doesn’t seem to be a problem. What makes these services a decent choice? The answer is simple: website builders are specially meant for users, who are just learning the basics of web design. Offering multiple templates, design customization tools and affordable pricing policy, they cover an extensive range of simple-to-complex web design needs. In fact, these systems may complete around 80% of user’s work, ensuring the top notch result. How does the easiest website builder look like? It is the best combination of ease of use and functionality required to solve a particular task. 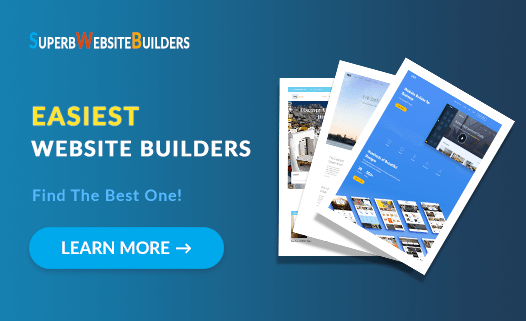 Whether you intend to create a business website, an online store, a landing page, a portfolio or any other project, you will always be able to find an easy-to-use website builder to come up to your needs. To simplify this task for you, we have compiled the list of the easiest website builders. Let’s review them in details now. The range of web building needs may vary a lot and finding a suitable tool proves to be a must-have task. Contemporary website builders are meant for beginners and web design pros and, thus, they come with features that meet the needs of both users categories. Website builders allow you to control the entire web building process. Content upload and management becomes simplified – just like the choice of a suitable thematic template. The services offer multiple features, integration options and design tools to let you create the required website design in no time and with minimum effort investment. The platforms provide step-by-step guidelines or tutorials to let you independently complete even the most complicated projects. It takes a couple of hours only to learn the major system’s specifications and start designing a website with it. So, we have discussed the positioning, benefits and spheres of application of website builders. However, there are many of them nowadays and it’s not easy to make a nice choice right from the start. Which one meets your needs most of all? I recommend considering five systems that are an ideal choice for newbies willing to create websites we have just talked about. WYSIWYG Editor – Wix uses a convenient drag-and-drop editor, which supports in-line editing and ensures outstanding WYSIWYG experience. The system puts you in charge of the web design process, letting you preview the result as you make the changes. Wix ADI – The Artificial Design Intelligence tool delivers stunning web design experience by making the web development process automated. Just provide your website info, upload content and wait until the system will automatically generate the website for you! Customizable Templates – Wix template collection currently encompasses more than 550 mobile-ready templates. Browse it to select the most suitable variant, apply a variety of design customization tools and create unique website design in no time! It’s also possible to select a blank template to create a website from scratch – nothing limits your imagination here! Free App Market – There is no need to look for the required extensions elsewhere. Wix provides amazing integration options available in the App Market. It is rich in widgets, add-ons and extensions that are paid and free. Make your choice to boost your website performance! Mobile Editor – It lets you edit the mobile version of your website. Just switch to the Mobile View mode in the control panel to fine-tune your mobile website design. Wix is an ultimate website builder for any web design task. Its exceptional ease-of-use, flexibility and convenience make the system a worthy choice for all user categories. With Wix, your web design experience will become interesting and engaging. No Technical Skills Needed – Its drag-and-drop editor allows for simple and quick design customization. The preview option lets you see the way your website looks in different modes as you design it. If there is something you don’t like about it, you can instantly make the required changes even on the go. Responsive Templates – With uKit, the process of website creation becomes much simplified due to the variety of responsive templates you may choose from. The themes can be switched during the web development process, which is a huge advantage for beginners. Widget Integration – The website builder lets you create website structure not only by arranging the content blocks, but also by integrating versatile widgets. Their choice is not quite rich, but those that are available will perfectly fit any type of project. Temporary Website Management Rights – This feature simplifies the process of website creation for inexperienced users, who may work on the website development in cooperation with more skilled designers. Under this condition, the system automatically creates the back up version of the website to prevent accidental problems. Easy Promotion – uKit comes with an integrated Promotion widget, which allows filling out the major SEO parameters and identifies current website statistics as well as factors that have to be improved to reach the best result. Quality responsive templates, intuitive dashboard and understandable settings of elements make uKit one of the easiest website builders to create business websites. What’s more, the system is known for its affordability, offering the cheapest prices in the niche. Storefront Editor – After the sign up procedure, you may reach the Storefront Editor of the system, where you can fine-tune your website. There are two areas here: a control panel, where you can make the required edits and a live preview section, where you can watch the result. This feature won’t let you get lost in the system, even if you are a first-time visitor. Synchronization Options – When working with Shopify, you can synchronize your account with external apps and accounting software. This eliminates the necessity to additionally integrate them and contributes to the ease of use. Live View Mode – By using the feature, you can control your web store statistics and performance without the need to use other programs for this purpose. The integrated feature lets you track the traffic amount, locations users comes from, conversion rates, sales statistics, page views and other important parameters. 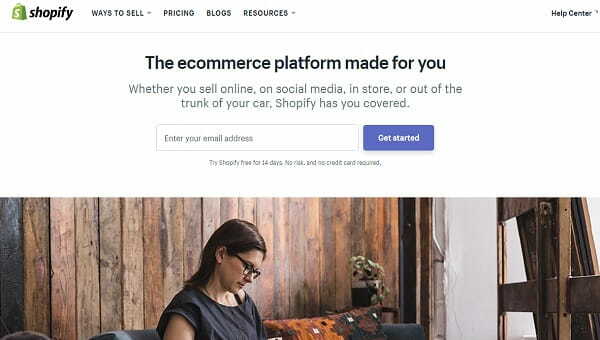 Enhanced Web Store Security – All web stores launched in Shopify are protected by the SSL Certificate for the enhanced payment and content safety. The system also offers Fraud Protection feature for Shopify payments. Simplified Mobile Shopping Experience – Application of Shopify Shopcodes available in the system App Store makes mobile shopping simpler. The platform generates unique codes customers may use to buy products in the web store. Multilingual Support – To expand your online store reputation, you can create several language versions of it based on the locations you target. It doesn’t take much time to connect the feature, but this boosts your web store productivity. Shopify is a worthy solution for users willing to create and manage small-to-large online stores without serious effort and time investment. This eCommerce software is powerful, but it is quite easy-to-use both for non-techies and web design pros. AIDA Assistant – Guides you through the process of website development and automatically creates a project for you. What you need is to provide your content the system will further use to construct a website. This ensures impressive ease-of-use and convenience, especially for non-tech savvy users. eCommerce Module – Bookmark is also known for its eCommerce module. Its integration lets you create and manage online stores with convenience and ease. Module-Based Websites – The website builder makes it possible to create websites by using modules, which resemble standard widgets. The modules are versatile, but you can choose between those for standard websites and online stores. Simplified Website Statistics – The platform comes with a simplified statistics collection system, which lets you track your website ranking, performance and productivity. Bookmark is an advanced AI-based website builder, which ensures ease of use and guarantees great result. Websites created with the system feature decent performance and outstanding design. Even a newbie can cope with their development as AIDA is always at hand here. Installation Simplicity – Almost any hosting provider offers automatic WordPress installation. You don’t have to do anything – just get the subscription and start building a website. No HTML Skills Required – Due to specialized extensions, you can create a simple website without any coding knowledge. Complex projects, however, imply programming skills. Absolute Website Customization – To build a website with WordPress, you have to create its structure by adjusting the major settings. There is much you can change here: backgrounds, fonts, colors etc. You can also upload media files or other content types you consider necessary for your website. Plugin Integration – There are multiple apps and plugins for WordPress on the web. It’s not a problem to find and integrate them. Just watch out of untrusted web developers and check their reputation prior to getting plugins from them. WordPress is an absolutely free Content Management System. It doesn’t require deep understanding of web design nuances and makes it possible to create functional websites. This is easy even for users, who don’t have any experience in website design. However, it may take some time to explore the major WordPress characteristics. When it comes to the ease of use, you won’t find a simpler solution than website builders. These systems let you focus on web design customization and filling your site with content without distracting to challenging web design nuances. Instead, all technically complex stages of website creation are left far beyond user attention, which contributes to better result. Wix is the easiest website builder, which comes with an extensive feature set, 550+ mobile-ready customizable templates, intuitive interface and affordable pricing options. uKit is a cloud website builder, which is mostly chosen for launching business websites and ensures ease-of-use, convenience and slight learning curve. It takes a copule of hours to publish your own responsive website. Shopify is a reputable eCommerce software that works great for the development of small-to-large online stores. It has its easy-to-use visual storefront editor, own CRM and marketing system. Bookmark has distinguished itself as an advanced AI-powered website builder, which additionally comes with eCommerce options and provides ease-of-use for newbies and web design pros. WordPress is an easy CMS, which enjoys popularity with users across the globe due to its convenience, extensive plugin integration options and abundant choice of customization tools. Just choose a preferable hosting and start building! If you really intend to develop a project with a website builder, it makes sense to test and explore all of the services reviewed in the article. These are the easiest website builders, but each of them has its own specifications and characteristics. Make sure to find them out prior to choosing the platform that will work best for your project.